Note: Recently I wanted to photograph some hummingbirds through a patio door, but that area of the window was dirty. For this small job I got out the Windex and paper towel and tried to clean an about "14 x 8" area to shoot through. I spent about as long as it would have taken to clean the entire window with the squeegee (if doing several at a time), and it seemed to mostly smear the dirt around. The area never came really clean. I'm certainly no professional -- my comments are based on doing 3 patio doors and 4 large windows inside and out a couple of times a year. So, if you see professional window washers' advice, listen to them instead of me. I put a small amount (1/3 teaspoon?) of whatever dishwashing liquid my wife happens to have (right now it's blue Dawn) in a 2 1/2 gallon mop bucket 2/3 full of warm water and gently swirl it around. I dunk the scrubber in the bucket. As I remove the scrubber from the bucket I wring it out by passing it through the circle formed by my thumb and index finger (see picture on the right). I start by tilting the scrubber at about 45 degrees to the window and use its end to go around and clean into the edges of the window. If I can reach the top of the window without a pole I move the squeegee sideways (left to right) working from the top down. The tops of many of my windows are too high and I don't have one of those special sideways squeegees. In this case I go down the right side of the window, then work my way across the window using top to bottom strokes with the right edge of the squeegee in the dry area and at a slight down-to-the-left tilt so the water runs off into the wet area. 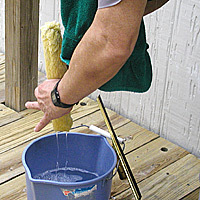 One key to this method is to wipe the squeegee blade after each pass. I use an old terrycloth towel for this, and I use a clean folded corner of the towel to wipe the very edges of the window where I can't use the squeegee to remove the water. If you do several windows during the same session you'll need to change towels occasionally. One problem I've never solved -- when using the squeegee in top down strokes the tip of the squeegee leaves a water trail in the dry area. I wipe that off with the towel after each pass and it usually doesn't leave a streak. This doesn't seem to be a problem when squeegeeing side-to-side. Also, going top-to-bottom makes it hard to keep the squeegee moving smoothly near the bottom of doors. If you find this a problem, a final left-to-right pass across the bottom may clean it up. If it's an inside window, put a towel along the bottom of the window to catch any runoff. Watch for and wipe up any water that gets on the windowsill. An important part of the secret is to get a good quality squeegee. A $4 one won't do it. However, my 18" squeegee is too long. My previous squeegee (which mysteriously disappeared) was 14" inch and that was a good length for me. When I bought the replacement I wanted 14" but they didn't have any in stock. I find the 18" hard to control. I had to choose between 12" and 18". I thought the 12" would require too many passes, but next time if I can't find a 14" I'll take the 12". Expect to pay about $10-$12 for a squeegee (after that replacement blades are about $2) and about $12 for a scrubber (replacement covers are about $4). I have a 10" scrubber which works well for me. 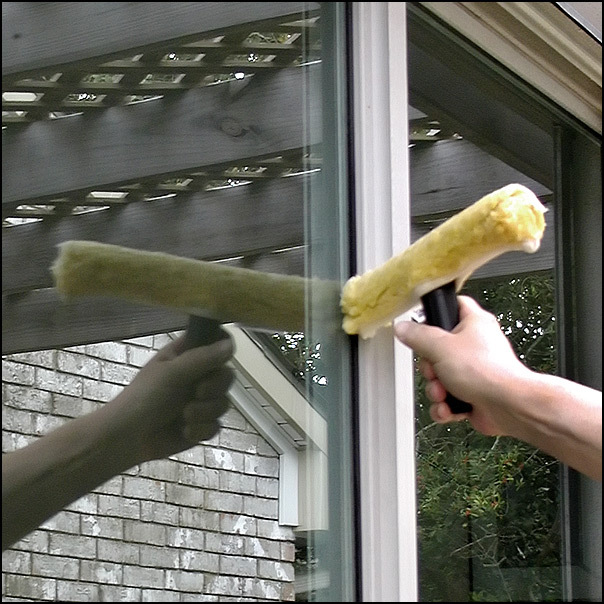 An extension pole will cost about $14-$16 if you need one -- you won't need one if you can reach the top of your highest window with the squeegee. A 14" rectangular bucket would be handy (so the scrubber will go all the way into the water), but I don't have one. In summary, all my gear -- squeegee, scrubber and pole -- cost about $35-$40. Oh, yes. 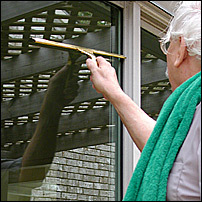 One more thing, don't wash a window that's in the sun -- catch it in the shade or at dawn or wait for a cloudy day. If all this seems complicated, it's not. I just over-explain things trying to be sure they're clear. .. my favorite for good climate weather is cheap liquid shampoo. If you're just doing the windows around the house, go with the cheap stuff. None of my customers has ever complained up here in Canada. When looking for those odd sized squeegees, buy one a size bigger, remove the rubber portion, cut off the metal part, re-center in the handle, cut the rubber to fit and reinstall. If you have a lot of windows of a particular size you can made customized squeegees to fit.